The majority of the conductive plastic storage containers used in the electronics sector are black. This means they are instantly recognisable for what they are, especially when they are clearly identified with the ESD warning symbol. However, there are occasions when a non-charging plastic container, in a colour other than black, can be very useful. A typical example of the use of coloured containers would be for product segregation. 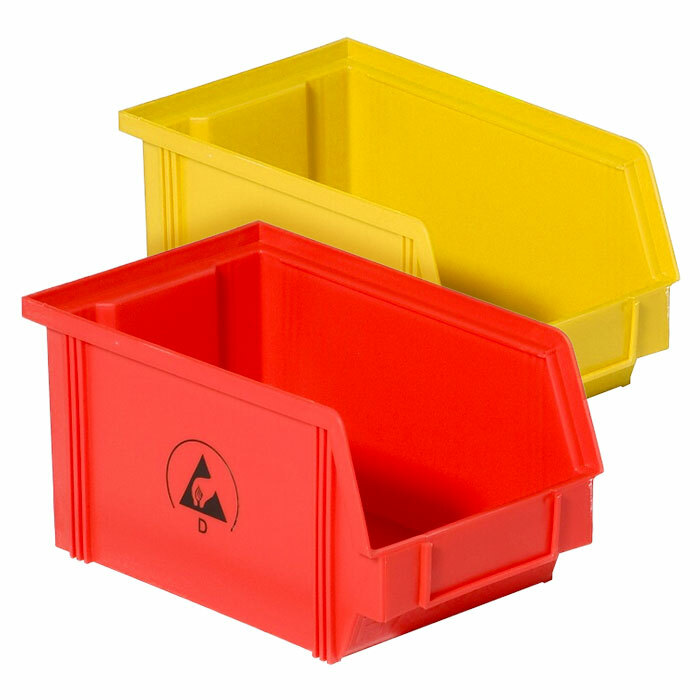 In addition to our established ‘Wez’ range of black conductive containers, SSE also offer red and yellow static dissipative plastic containers manufactured from an inherently dissipative polymer, and therefore suitable for use in static controlled environments. They come in a range of sizes, are stackable and can be supplied with or without lids. Coloured containers (or picking bins) for use on louvred panels are shown here – regular stacking containers in a range of sizes with lids can also be purchased. Details and prices are on the website. Click here for more details of our coloured, dissipative plastic containers.